PS We're Getting Married: Let there be light! Along with our color scheme of pink and gray, I knew that I wanted to have candlelight at our wedding, because the sun will eventually set, and while our venue comes with overhead lighting, I wanted something a bit more romantic and dreamy. This picture (found on Pinterest!) was a huge inspiration for me. The candles look like something out of a movie. The set includes 4 tapers, 6 votives in glass, and 12 tea lights. 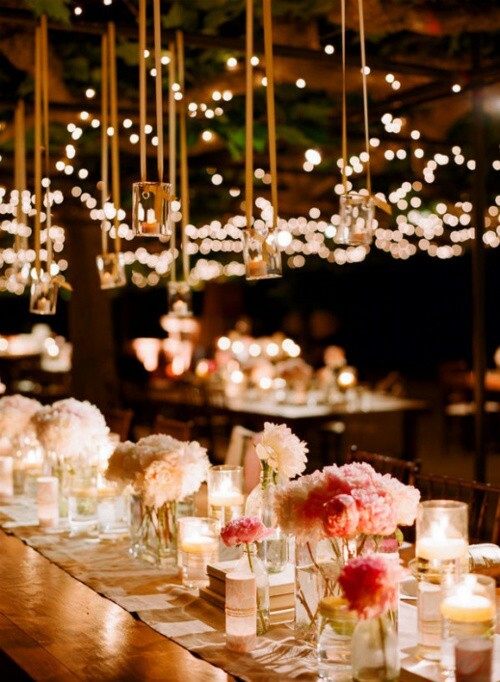 We regularly use tapers for our candleholders during dinner, so those would be put to good use, and we could use the votives and tea lights for our wedding. It was a win! After I convinced Silas to pick up 10 sets, we had 60 votives, and 120 tea lights. I think the cashier at Target thought I was completely insane. However, crazy or not, there was no way I was passing up a deal like this. 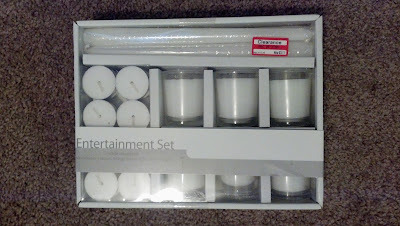 They were perfect for our needs, originally priced at $10.39, which would make our cost for candles $103.90. Clearance marked them down to $3.11, making our cost $31.11 for all the candles we'll need. Have you scored any big deals with your wedding?